Make Money Online Reviews Will Email Marketing Revolution PLR Revolutionize Your Marketing? 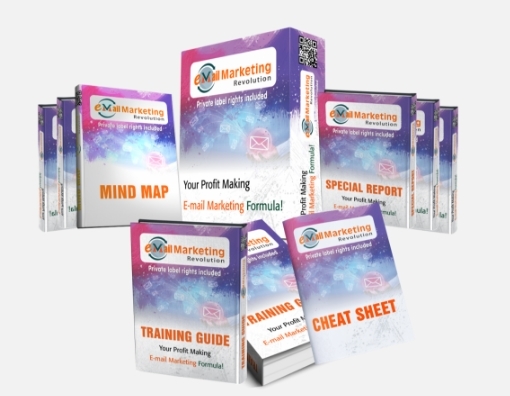 Will Email Marketing Revolution PLR Revolutionize Your Marketing? Rating: 2 Very basic training with lots of material devoted to promoting other products. The Good: You learn about the basics of email marketing. You get ready-to-go copy, graphics and email swipes for selling Arun's other affiliate products. You gain fairly generous PLRs for reselling EMR materials and even claiming them as your own. You get a 30-day money-back guarantee on EMR. The Bad: EMR offers very rudimentary training on email marketing, and very few (if any) email examples outside of Arun's affiliate promotions are provided. 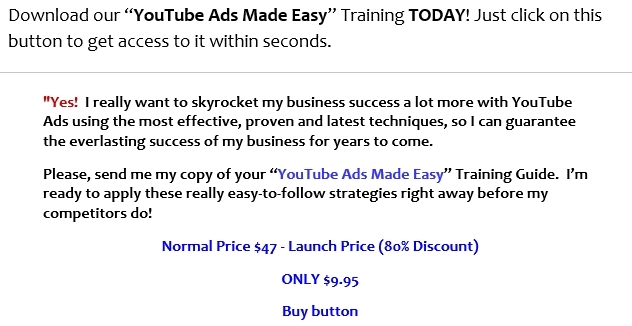 Much of the "training" material is devoted to promoting other affiliate products such as YouTube Ads Made Easy. The Bottom Line: EMR won't exactly revolutionize your email marketing campaigns, and you'll need to buy additional educational resources to really understand all the nuances of emails. There are better and more complete systems out there, including my #1 recommendation. Email marketing is touted by almost every marketing firm and guru as the #1 way to get subscribers and ultimately, sales. Unfortunately, too few affiliate and other marketers utilize email marketing to its full capacity. Some marketers (and entire companies) don’t even do email marketing. 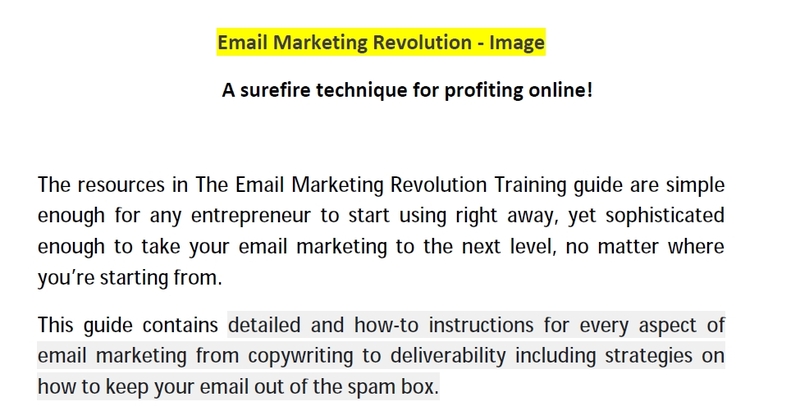 Because of this issue, Arun Chandran and his cohorts at Firelaunchers have recently released a training and PLR system called Email Marketing Revolution PLR. Incidentally, if you’re not sure what PLR stand for, click here. Module 1: Front-end sales video– You get doodle style videos that will improve sales conversions. Module 2: Well-designed sales page copy– Copywritten content is provided for your immediate use. Module 3: Premier training guide on email marketing– You gain access to marketing tools and techniques that will boost your business and drive traffic to your products. Module 4: Professionally designed graphics– A set of premade graphics is offered for your immediate use. Module 5: Animated banners– Arun’s team offers ready-to-use marketing banners for your business. Module 6: Professionally created expert email templates– You get email swipes that you can use in your customer emails. Module 7: Professional minisite– A ready-to-go sales funnel is provided here. Bonus 1: Cheat sheet– This item breaks down the course training into easy-to-follow steps. Bonus 2: Mind map– Here, you (and your customers) obtain a layout of the course and its training modules. Bonus 3: Top resources report– You learn about Instagram advertising techniques via the provided videos, tools and training courses. As if that weren’t enough, there are 7 additional bonus PLRs included. These ‘extra extra’ bonuses include PLR content on email marketing, IM copy swipes, Email Marketing Profits PLR, and something called Email Marketing Mogul. Does Arun’s product deliver on its promises? I purchased Email Marketing Revolution at its advertised price of $9.95 to find out. After my purchase of Email Marketing Revolution (EMR) was completed, I was immediately directed to a materials download area. 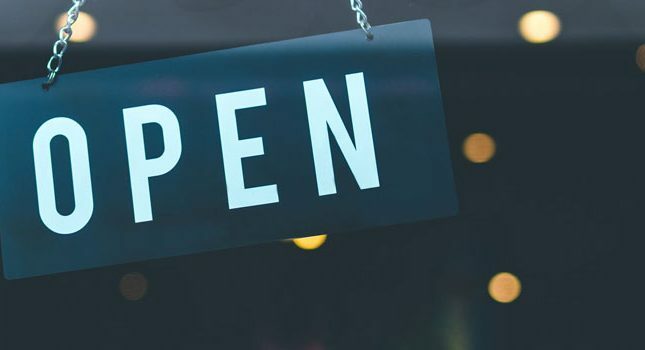 This was refreshing; many product marketers insist on having you go through upsells and cross-sells before you can access your purchased product. 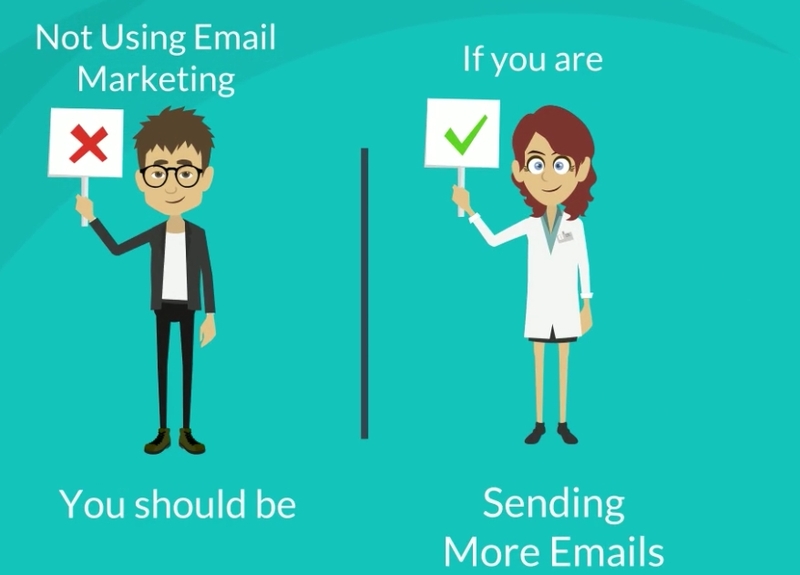 Front-end sales video: This set of basic 2-minute videos introduces you to EMR and explains (using published studies) why email marketing is a powerful means of generating sales. I next checked out Module 3, which was advertised to contain a guide to email marketing. 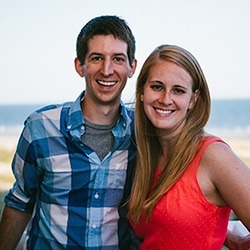 Here, I finally encountered the following content, which spanned a whopping 93 pages and actually offered insightful information about creating and sending emails, understanding open rates, generating lead magnets, etc. 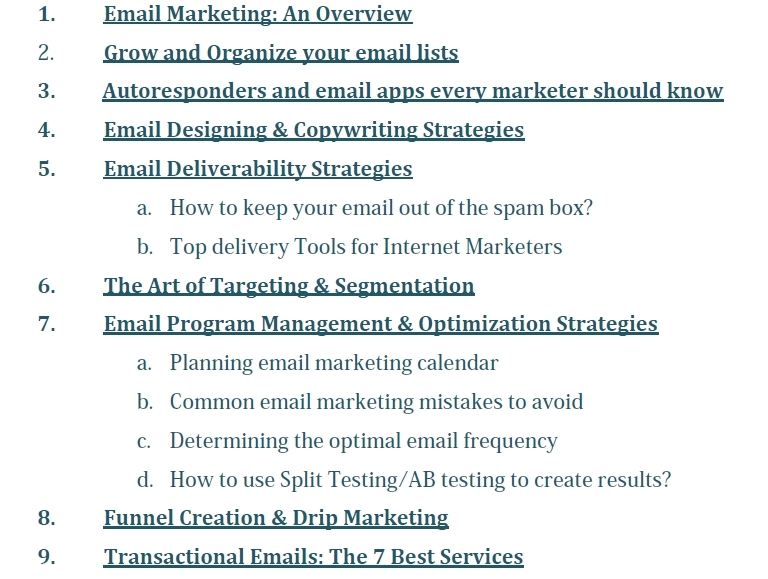 The content provided in this guide was an excellent resource for the beginner affiliate (or other) marketer just getting started with email marketing. Most of this information was written out and did not contain much “fluff” like stock images, enlarged quotes, etc. Because this product came with PLR, it could also be “authored” by its buyer and sent out as a lead magnet to win new customers. The below image shows a portion of this guide’s table of contents. As you can see just from this table, there is some good, meaty information to be had with this resource. So, akin to a majority of the other modules, you’re simply obtaining the materials necessary to market the product you just purchased. Modules 5, 6 and 7, which each contained animated banners, email templates, and the minisite, respectively, also all went back to supporting the marketing of EMR to other customers. What about the program bonuses? I was initially curious what the advertised cheat sheet and mind map contained. To call something a cheat sheet implied that there was a shortcut to email marketing that made it easier to execute. A mind map implied that you had a plan or blueprint to follow during your marketing efforts. There was also the advertised top resources report, which sounded like a good place to go to for extra information. I discovered that the cheat sheet was a set of resource links and case studies that all related to marketing EMR to a third party audience. As for the mind map, it simply organized all the cheat sheet material by topic area so that you could send out batches of case studies or resources to your audience in your emails. Theoretically, the case studies and resource links could stand alone and even be used in other product marketing emails. 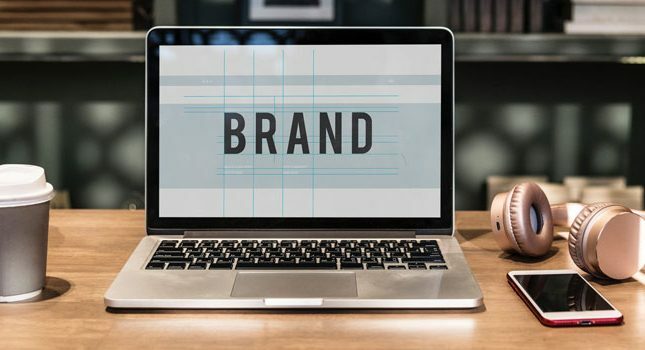 However, because they mostly relate to successful email marketing, they wouldn’t exactly apply to an affiliate marketer who was trying to sell running shoes, for example. 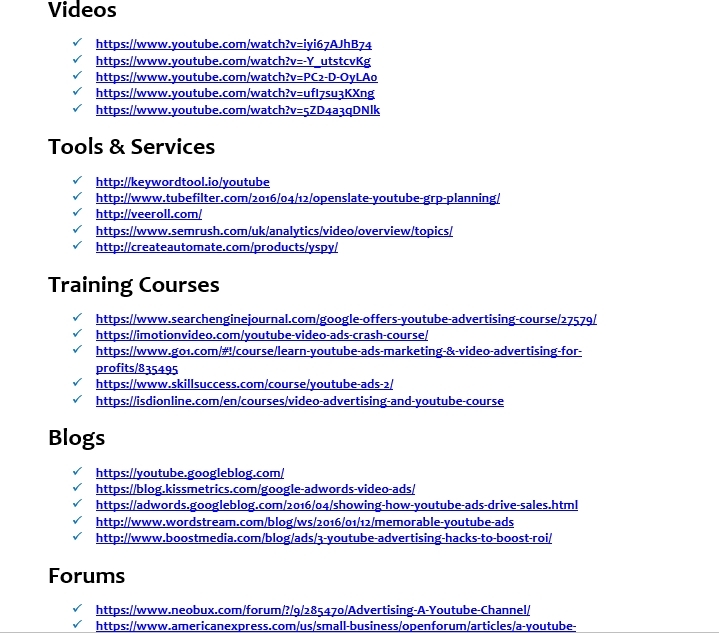 These resource links were (again) mostly applicable if you were marketing to an audience that had just purchased another one of Arun’s products, YouTube Ads Made Easy. However, you’d be hard-pressed to offer these resources on their own. Is Email Marketing Revolution worth it? Arun advertises his product as being a great resource for marketers attempting to learn how to create and send emails that convert. It’s not that he doesn’t deliver at least partly on his promise of providing instructional content. However, the material that he provides in his ebook is not exactly revolutionary or novel in its approach to email marketing. What’s more bothersome is the amount of collateral devoted to marketing the very EMR product you just bought, plus Arun’s YouTube Ads Made Easy product. In the end, unless you plan to market his products, you really only get that 93-page instructional guide for your $9.95.